Whoa! It's spooky in this attic! Quick! Let's find those holiday decorations and get out of here! Hey! Look at this piece of junk. Yikes! It talks ... a TALKING JUKEBOX that lights up and plays music? Join in the fun as Holly Jolly Jukebox spins records from the '40s to the '70s - back to the good ole days of swing, doo wop, beach music and disco! 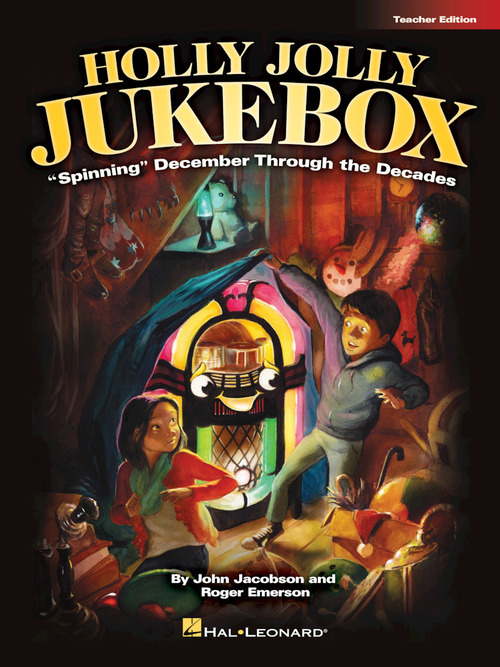 See how the Jukebox learns that we all have something to share no matter how old or outdated we think we are. This holiday musical features six original songs with connecting script and over 25 speaking parts. The Teacher Edition is filled with quality performance material including piano/vocal arrangements and choreography, script and helpful production guide. For added value, the ready-to-use student books include vocal parts and script, and come in handy 10-paks. To perform with recordings, there are 2 options. A Performance/Accompaniment CD is available separately. For cost-saving value, the Performance Kit/Audio includes the Teacher Edition, 20 Singer books and digital access to performance/accompaniment audio recordings. Dialog not recorded. Songs include: Swingin' Holiday, Doo Wop December, California Christmas, S-A-N-T-A, Something to Share, Jingle Bell Jam. Approx. 35 minutes. Suggested for grades 4-8.